Next post: Excuse Me, I’m PMSing! …you’ve heard that expression, right? Well, over the last few weeks, I’ve learned what it truly means to be an animal in nature. Having to fight to protect your family and surviving by any means necessary. Sounds the same as human life, right? Wrong. As humans we have the means and ability to protect ourselves from outside evil, well, at least for the most part. Where am I going with this? It’s simple…Claire the Duck. 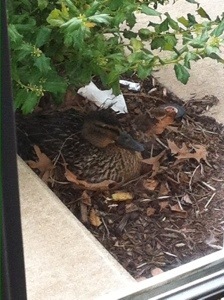 About a month ago a little duck made a nest by the front door of my Mother’s home. Every morning my Mother and Sister would see this duck and not quite understand why she was hanging around. Until one day they noticed a nest. Claire laid about 4 or 5 eggs and camouflaged them so they couldn’t be seen by anyone or anything. Mostly predators. She would stop by every morning and check on the eggs, camouflage them a bit more and go about her day. 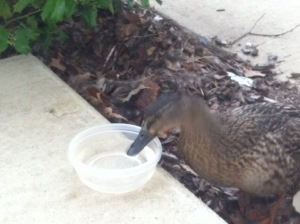 Once my Mother realized Claire’s purpose for hanging around her front door, she was instantly interested in this duck! Even going as far as doing research to understand an ducks cycle for laying eggs. Of course Claire is not naturally the ducks name, only a name given to the duck after my Mother and Sister fell in love with her. As days went on, they would feed her bread and give her water. She had truly become a part of the family. At one point the count of eggs went from 5 to 3 to 0. My Mother felt helpless, as wells as sad for little Claire. She put in so much work to protect her eggs and in a blink they were gone. She tried to survive for them, but now has nothing to show for it. But even if she tried to fight back, what’s a duck going to do to a fox or raccoon? There wouldn’t have been much of a fight without her losing her life as well. The food chain. My Mother was devastated. Not only because Claire lost her eggs, but because Claire wouldn’t be coming back. Now that Claire knows her newfound haven is no longer safe, she will move on to another place and hope for a better outcome. Can you imagine a life like that? Animals like this truly know what it means to have to fight. And while all of this may seem frivolous, it’s a great analogy on how as humans we don’t take this life seriously.